Meeting with the United Nations Resident Coordinator in South Africa discussed issues ranging from strengthening capacity of the WHO Country Office to work closely with the Office of the RC in supporting the Government of South Africa as it addresses its triple development challenges of poverty, inequity and unemployment. For best developmental outcomes, RC and Dr. Kalu agreed that to be relevant in South Africa, the support of each United Nations (UN) agency or fund must be informed by evidence. Both also agreed that for the UN in South Africa to be effective, all the agencies and funds must adopt pro-partnerships approaches aimed at streamlining engagement with the host government and with the limited international development support agencies in the country. While WHO’s focus is mainly normative guidance, supporting implementation and generating evidence, Dr Kalu shared the importance of accounting for what WHO is contributing to improved health outcomes in South African. “It is very important for the Organization to also be engaged at provincial level to strengthen implementation of national policies and guidelines and attainment of national health targets in each province” said Dr Kalu. He therefore undertook to visit selected provinces to learn more about the health challenges in the country. Ms Nardos acknowledged WHO work and its strong working relationship with the Department of Health. Among others, “this is demonstrated by the ongoing work including the support WHO has provided in the ongoing development of South Africa’s National Health Insurance (NHI)”. Dr. Kalu used the opportunity to brief the RC on the outcome of the recently held Presidential Health Summit and expatiated on the need for the relevant United Nations agencies and funds to support implementation of the NHI. The meeting with the Minister of Health was the first official contact between the two. The Minister welcomed Dr Kalu and acknowledged his arrival in the country and working from day one. Their meeting focussed on how WHO can support the Country achieve its national health outcome targets through implementation of the NHI. This led to the Minister providing a detailed background information on South Africa’s ongoing effort to develop its NHI including the milestones already achieved ad the challenges that remain. The Minister also acknowledged the invaluable support WHO and OECD provided on the cost of health care in South Africa, a support that enabled the country’s Health Market Inquiry (HMI) that investigated South Africa’s private healthcare market, to conclude that the Private Health Market is characterised by: high and rising costs of healthcare and medical scheme cover; disempowered and uninformed consumers; and ineffective regulation and failures of accountability at many levels. The Minister further informed Dr Kalu how WHO’s word is one of the most respected in the country. In his words “WHO’s word is sacrosanct”. Dr Kalu in response informed the Minister that the UN in South Africa will define additional support it will provide in setting up the NHI fund with UNDP and the World Bank working with and through WHO to ensure a One UN common purpose towards accelerating NHI realisation. Dr. Kalu concluded that WHO will continue to provide high quality support to South Africa and with enhanced focus on supporting implementation at Provincial level, the aim being to further attainment of national outcome targets in all the provinces. With Dr Dhlomo and Dr Gumede of the Kwazulu Natal Province, in the MEC words were “… bring your presence and footprint in the province”. Dr Dhlomo informed Dr Kalu that the KwaZulu Natal Province is the second most populous province in South Africa with average life expectancy estimated at 52 years; that the main causes of mortality in the Province associated with poverty and under-development are Human Immunodeficiency Virus (HIV) and Acquired Immune Deficiency Syndrome (AIDS), Tuberculosis (TB), parasitic diseases, perinatal and maternal conditions and malnutrition. So “if WHO wants to improve health outcomes in South Africa start in KZN” said Dr Dhlomo. He further acknowledged that the province is the only one in South Africa to have achieved the milestone of putting more than a million people on ARVs, having also circumcised more than a million men. Dr Kalu informed Dr Dhlomo that he is in the Province to learn about its health system and shared interest in further engagement particularly in using data for action to ensuring the province meets its obligations in meeting the National Health Outcome targets. With the University of KwaZulu Natal WHO Collaborating Centre for Educating Nurses and Midwives in Problem-solving the meeting focussed on new strategies to deliver on WHO mandate beyond generating and using evidence. He emphasized how WHO can facilitate dialogue between and with other stakeholders. The Collaborating Centre could focus on systems strengthening through capacity building and strengthening human resources for diseases surveillance. 3. Working with communities using problem solving approaches to address priority health problems focussing on maternal and child health, mental health, HIV?AIDS and TB and non-communicable diseases. It was agreed that a meeting be organized in first quarter of 2019 to bring together all the WHO Collaborating Centres together to chart the way forward in enhancing the support of the collaborating centres to the national health system especially in improving national health outcome targets. 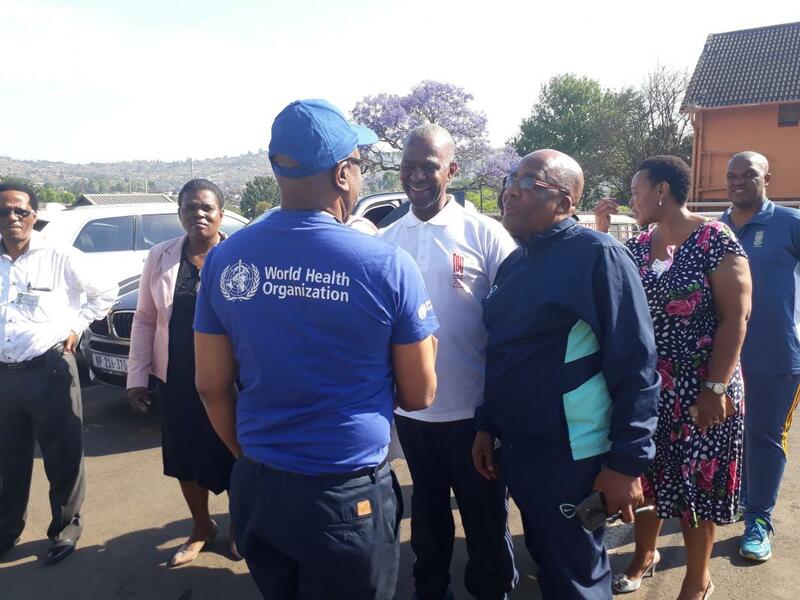 Dr Kalu was in KwaZulu Natal Province as part of the delegation of the Minister of Health who was launching the WHO supported National Cancer Campaign in Pietermaritzburg. Globocan estimates indicates that about 107 467 people are expected to have cancer in South Africa in 2018, 59 703 women and 47 464 men. At the launch, Minister Motsoaledi announced that the Government has negotiated down the price of trastuzumab to R6 531.61 in public health facilities, allocated funds for 12 additional linear accelerators for various hospitals in the country, bring the number of public hospitals with this vital facility to 11; thus decentralizing cancer treatment services in the country.